Are you welcoming the first signs of spring with the enthusiasm or still hibernating from the cold and wind? Not sure? Neither are we so this newsletter is mix of things past, present and future so should be something for everyone – oh yeah and there’s a competition. What more could you want? 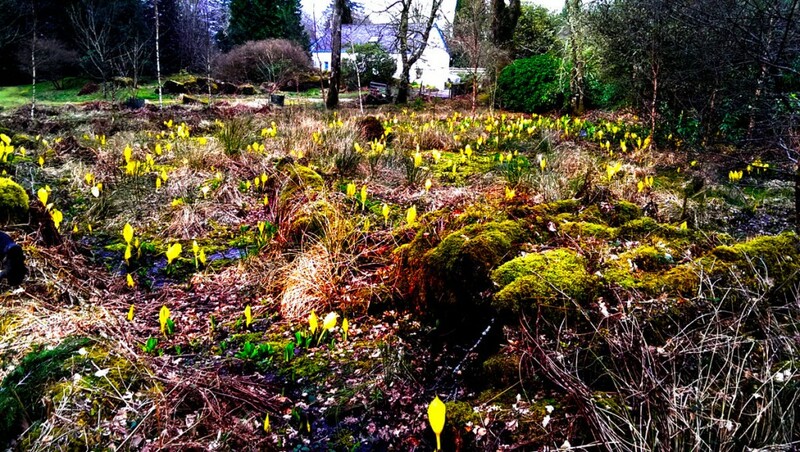 So this time last year we were preparing to enjoy a Creative Week at Ardkinglas, Loch Fyne. Proof that we did more than enjoy good food, drink, company and beautiful countryside can be found in Sophie Bancroft’s new album ‘Songs’ which features two tracks written during our stay – If You Were There and Friday Morning in Ardkinglas. To buy the album and read all the rave reviews go to Sophie’s website. Signed copy of ‘Songs’ to the first reader who correctly identifies the flowers in the photo above. No terms and conditions – just reply to this e-mail, first come, first served! The Community Singing workshops were well attended this winter term with lots of happy singers venturing out in the snow to the village hall. Some of the group are going to sing at the Community Concert on 19th March (see Local Events below for more details). They’ll be ably led by Frances Cockburn, one of the participants, as Corrina Hewat, the normal leader, is recovering from a back operation. Don’t worry she’ll be fine and back to doing stuff like this very soon http://www.corrinahewat.com/video/one-song/ The term is finished now but will start up again in the autumn with fresh new songs. Think about joining us for a good sing and a huge amount of laughs and frivolity. The Pathhead Fiddlers had a braw time in The Foresters on Burns Day. The sharing of tunes by young and not – so – young punctuated by a ‘Burns Turn’ or two followed by a plate of haggis, neeps n tatties laid on by The Foresters made for a very fine afternoon indeed. Put it in the diary for next year! THE PATHHEAD CHOIR led by Sophie Bancroft & Gina Rae starts on Wednesday 29th April @ Pathhead Village Hall, 7.30 for 7.45pm. Term will run for 8 weeks excluding 27 May. For more information just reply to this e-mail. A fantastic week of traditional music and arts workshops with some of the best tutors from Scotland and beyond! Come to improve your current instrument or try a new one, play with others, make new friends and have fun. Beginners welcome! When: Monday 13th – Thursday 16th April 2015, 9:30am – 3:45pm. Where: Tynecastle High School, Edinburgh. Tutors: Adam Sutherland, Morag Brown, Daniel Thorpe, Amy Geddes, Siobhan Miller, Tom Oakes, Mairearad Green, Anna Massie and Strange Town (Youth Theatre). PLUS Best of Trad showcase concert on Tuesday 14th at the Church Hill Theatre and participants’ Big Bash concert and cèilidh, also at the Church Hill Theatre on Thursday 16th. Cost: £100 (£80 for additional family members) Concessions available. Sophie Bancroft and Tom Lyne. Workshop fee: £75. 10% discount per student if 1 or more sibling also attending. Treat yourself to this fun, intimate and intensive workshop with a huge amount of individual focus as well as group work (4 workshop participants max) @ Sophie and Tom’s house. microphone technique, music theory + much more!! Bring your own lunch, B+B nearby if needed. Please email Sophie asap to reserve a place on this workshop – a non-refundable deposit of £150 will be required to secure booking. Jenny Gardner has been busy with ‘Pathedible’, a brand new venture, aiming to encourage local people to get involved in growing veggies on unused spaces in Pathhead. We have the go – ahead from Midlothian Council to establish deep beds on the grass verge in Chapel Close, plus full support and a small financial donation from Tynewater Community Council and ‘Keep Scotland Beautiful’ small community grant fund to get us going. Check out the facebook page to find out more. PYP are doing this event for a Dynamic Youth Award. The girls have designed, adapted and are modelling their outfits. The boys are making and serving non-alcoholic cocktails. There is no charge for entry but there will be a donation box for guests with all funds going to the PYP. Ticket prices are £5 for adults £2 for children and OAPs. The Community Concert will be hosted by Eric Davidson and feature performances by lots of talented locals including the Pathhead Players, Community Choir, Clarinet Group from Tynewater Primary, Ryan Hunter, Morgan Welsh, Alasdair Barron and the Pathhead Youth Project. The bar will be open before the show starts, at the interval and at the end. Tea and coffee will also be on sale at the bar and PYP will be running a tuck shop for the children. 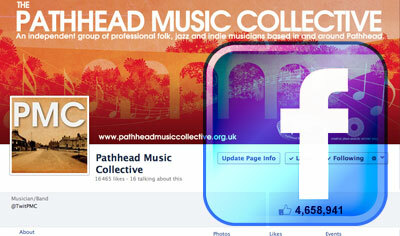 Get to Pathhead Sports and Social Club Facebook page for all events including karaoke on Saturday 7 March from 9pm.